Malaysia Airlines Berhad (MAB) (Malay: Penerbangan Malaysia Berhad), formerly known as Malaysian Airline System (MAS) (Malay: Sistem Penerbangan Malaysia), branded as Malaysia Airlines, is an airline operating flights from Kuala Lumpur International Airport and from secondary hubs in Kota Kinabalu and Kuching to destinations throughout Asia, Oceania and Europe. Malaysia Airlines is the flag carrier of Malaysia and a member of the oneworld airline alliance. The company headquarters are located at Kuala Lumpur International Airport. In August 2014, the Malaysian government's sovereign wealth fund Khazanah Nasional—which then owned 69.37% of the airline—announced its intention to purchase remaining ownership from minority shareholders and de-list the airline from Malaysia's stock exchange, thereby renationalising the airline. Malaysia Airlines owns two subsidiary airlines: Firefly and MASwings. Firefly operates scheduled flights from its two home bases Penang International Airport and Subang International Airport. The airline focuses on tertiary cities. MASwings focuses on inter-Borneo flights. Malaysia Airlines has a freighter fleet operated by sister company MASkargo, which manages freighter flights and aircraft cargo-hold capacity for all Malaysia Airlines' passenger flights. Malaysia Airlines traces its history to Malayan Airways Limited, which was founded in Singapore in the 1930s and flew its first commercial flight in 1947. It was then renamed as Malaysian Airways after the formation of the Federation of Malaysia in 1963. In 1966, after the Independence of Singapore Agreement 1965, the airline was renamed Malaysia–Singapore Airlines (MSA), before its assets were divided in 1972 to form two separate national airlines—Malaysian Airline System (MAS, since renamed as Malaysia Airlines) and Singapore Airlines. Despite numerous awards from the aviation industry, being crowned 'The World's 5-Star Airline' by Skytrax multiple times (2009, 2012 and 2013) and recognition from the World Travel Awards as 'Asia's Leading Airline' (2010, 2011 and 2013), the airline struggled to cut costs to cope with the rise of low-cost carriers in the region since the early 2000s. In 2013, the airline initiated a turnaround plan after large losses beginning in 2011 and cut routes to prominent, but unprofitable, long-haul destinations, such as the Americas (Los Angeles and Buenos Aires) and South Africa. Malaysia Airlines also began an internal restructuring and intended to sell units such as engineering and pilot training. There were operating services between Singapore, Kuala Lumpur and Penang. Wearne's Air Service was started by two Australian brothers, Theodore and Charles Wearne. The service commenced as a thrice weekly flight between Singapore and Penang. The first flight, using an 8-seater de Havilland DH.89A Dragon Rapide took place on 28 June 1937 This inaugural flight departed Singapore from the then brand-new Kallang Airport, which had just opened earlier in the same month on 12 June. Later, a second DH.89A enabled the expansion to daily services as well as the addition of Ipoh as a destination. During World War II, WAS services ceased after the Japanese occupation of Malaya and Singapore in 1941. An initiative by the Alfred Holt's Liverpool-based Ocean Steamship Company, in partnership with the Straits Steamship Company and Imperial Airways, resulted in the incorporation of "Malayan Airways Limited" (MAL) in Singapore on 12 October 1937, but the first paying passengers could be welcomed on board only in 1947, some 10 years later. After the war, MAL was restructured to include just the partnership of Straits Steamship and Ocean Steamship. The airline's first flight was a charter flight from the British Straits Settlement of Singapore to Kuala Lumpur, on 2 April 1947, using an Airspeed Consul twin-engined aircraft. This inaugural flight on the "Raja Udang", with only five passengers, departed Singapore's Kallang Airport and was bound for Kuala Lumpur's Sungai Besi Airport. Weekly scheduled flights quickly followed from Singapore to Kuala Lumpur, Ipoh and Penang from 1 May 1947 with the same aircraft type. The airline continued to expand during the rest of the 1940s and 1950s, as other British Commonwealth airlines, such as BOAC and Qantas Empire Airways, provided technical assistance, as well as assistance in joining the IATA. By 1955, Malayan Airways' fleet had grown to include a large number of Douglas DC-3s, and finally went public in 1957. Other aircraft operated in the first two decades included the Douglas DC-4 Skymaster, the Vickers Viscount, the Lockheed L-1049 Super Constellation, the Bristol Britannia, the de Havilland Comet 4 and the Fokker F27. Over the next few years, the airline expanded rapidly, boosted by post-war air travel demand when flying became more than a privilege for the rich and famous. By April 1960, the airline was operating Douglas DC-3s, Super Constellations and Viscounts on new routes from Singapore to Hong Kong, and from Kuala Lumpur to Bangkok via Penang. Flights were also introduced from Singapore to cities in the Borneo Territories, including Brunei, Jesselton (now Kota Kinabalu), Kuching, Sandakan and Sibu. With the delivery of an 84-seat Bristol Britannia in 1960, the airline launched its first long-haul international flight, to Hong Kong. When Malaya, Singapore, Sabah and Sarawak formed the Federation of Malaysia in 1963, the airline's name was changed, from "Malayan Airways" to "Malaysian Airways" (though still abbreviated to MAL). MAL also took over Borneo Airways. In 1966, following Singapore's separation from the federation, the airline's name was changed again, to Malaysia-Singapore Airlines (MSA). The next year saw a rapid expansion in the airline's fleet and routes, including the purchase of MSA's first Boeing aircraft: the Boeing 707s, as well as completion of a new high-rise headquarters in Singapore. Boeing 737s were added to the fleet soon afterwards. The differing needs of the two shareholders, however, led to the break-up of the airline just 6 years later. The Singapore government preferred to develop the airline's international routes, while the Malaysian government had no choice but to develop the domestic network first before going regional and eventually international. MSA ceased operations in 1972, with its assets split between two new airlines; Malaysian Airline System (MAS), and Singapore Airlines. With the Singapore government determined to develop its airlines' international routes, it took the entire fleet of seven Boeing 707s and five Boeing 737s, which would allow it to continue servicing its regional and long-haul international routes. Since most of MSA's international routes were flown out of Singapore, the majority of international routes were in the hands of Singapore Airlines. In addition, MSA's headquarters, which was located in Singapore, became the headquarters of that airline. The initials MSA were well regarded as an airline icon, and both carriers tried to use them. Malaysian went for MAS by just transposing the last two letters and choosing the name Malaysian Airline System, while Singapore originally proposed the name Mercury Singapore Airlines to keep the MSA initials, but changed its mind and went for SIA instead. Acronyms for airline names later became less fashionable, and both carriers then moved on to their descriptive names. MAS took all domestic routes within Malaysia and international routes out of that country, as well as the remaining fleet of Fokker F27's. It began flights on 1 October 1972 and soon expanded, including introducing flights from Kuala Lumpur to London. In that year, MAS operated flights to more than 34 regional destinations and six international services. In 1976, after receiving its DC-10-30 aircraft, MAS scheduled flights to Europe, with initial flights from Kuala Lumpur to Amsterdam, Paris and Frankfurt. An economic boom in Malaysia during the 1980s spurred growth of MAS. By the end of the decade, MAS was flying to 47 overseas destinations, including eight European destinations, seven Oceanian destinations, and United States destinations of Los Angeles and Honolulu. In 1993, MAS reached South America when the airline received its Boeing 747 aircraft. MAS became the first airline in Southeast Asia to serve South America via its flights to Buenos Aires, Argentina. Malaysia Airlines also flew to Mexico City between 1994 and 1998 with fifth-freedom rights to carry passengers between Mexico City and Los Angeles, en route to Kuala Lumpur. Prior to the Asian Financial Crisis in 1997, the airline suffered losses of as much as RM 260 million after earning a record-breaking RM333 million profit in the financial year 1996/1997. The airline then introduced measures to bring its P&L back into the black. For the financial year 1999/2000, the airline cut its losses from RM700 million in the year 1998/1999 to RM259 million. The airline plunged into further losses in the following year, however, amounting to RM417 million for the financial year 2000/2001 and RM836 million for financial year 2001/2002. With these losses, the airline cut many unprofitable routes, such as Brussels, Darwin, Madrid, Munich and Vancouver. The airline recovered from its losses the following year, achieving its then-highest profit, totalling RM461 million. In 2005, MAS suffered yet another period of unprofitability, reporting a loss of RM1.3 billion. Revenue for the financial period was up by 10.3% or RM826.9 million, compared to the same period for 2004, driven by a 10.2% growth in passenger traffic. International passenger revenue increased by RM457.6 million or 8.4%, to RM5.9 billion, while cargo revenue decreased by RM64.1 million or 4.2%, to RM1.5 billion. Costs increased by 28.8% or RM2.3 billion, amounting to a total of RM 10.3 billion, primarily due to escalating fuel prices. Other cost increases included staff costs, handling and landing fees, aircraft maintenance and overhaul charges, Widespread Assets Unbundling (WAU) charges and leases. The Malaysian government then appointed Idris Jala as the new CEO of MAS on 1 December 2005, to execute changes in operations and corporate culture. Several weaknesses in airline operations were identified as the causes of the RM1.3 billion loss. The most substantial factor in the losses was fuel costs. For the period, the total fuel cost was RM3.5 billion, representing a 40.4% increase compared to the same period in 2004. Total fuel cost increases comprised RM977.8 million due to higher fuel prices and another RM157.6 million due to additional consumption. In the third quarter, fuel costs were RM1.26 billion, compared to the RM1.01 billion in the corresponding period in 2004, resulting in a 24.6% increase or RM249.3 million. Another factor for the losses was poor revenue management. MAS substantially lagged its peers on yield. Some of this gap was due to differences in traffic mix, with less business traffic to and from Malaysia than to and from Singapore, but much of it was due to weaknesses in pricing and revenue management, sales and distribution, brand presence in foreign markets, and alliance base. Moreover, MAS had one of the lowest labour costs per available seat kilometres (ASK) at USD0.41, compared to other airlines such as Cathay Pacific and Singapore Airlines at USD0.59 and USD0.60 respectively. Despite low labour costs, however, the ratio of ASK revenue to this cost was, at 2.8, much lower than Singapore Airlines, where the ratio is 5.0, and slightly higher than Thai Airways There are other factors listed in the later-revealed Business Turnaround Plan of Malaysia Airlines, all leading to the net loss of RM1.3 billion in the year 2005. Under the leadership of Idris Jala, MAS launched its Business Turnaround Plan in 2006, developed using the Government-linked Company (GLC) Transformation Manual as a guide. Under the various initiatives, launched together with the Business Turnaround Plan, Malaysia Airlines switched from losses to profitability between 2006 and 2007. When the Business Turnaround Plan came to an end, the airline posted a record profit of RM853 million (USD265 million) in 2007, ending a series of losses since 2005. The result exceeded the target of RM300 Million by 184%. Route rationalising was one of the major contributors to the airline's return to profitability.MAS pared its domestic routes from 114 to 23, and also cancelled virtually all unprofitable international routes. Apart from that, Malaysia Airlines also rescheduled all of its flight timings and changed its operations model from point-to-point services to hub and spoke services. Additionally, the airline started Project Omega and Project Alpha to improve the company's network and revenue management. Emphasis has been placed on six areas: pricing, revenue management, network scheduling, opening storefronts, low season strategy and distribution management. MAS then pushed for new aircraft purchases, using its cash surplus of RM5.3 billion to eventually purchase new narrow-body aircraft and wide-body aircraft. Due to Idris Jala's appointment to cabinet in August 2009, Tengku Azmil Zahruddin took over as the airline's new CEO. In December that year, MAS announced the purchase of 15 new Airbus A330 aircraft, with options for another 10. Expected to be delivered between 2011 and 2016, they are intended to operate on medium-haul routes to eastern Asia, Australia, and the Middle East. The airline's plans are to run the Airbus A380 planes, which were then introduced into service in 2012, on long-haul routes, the A330s on medium-haul routes, and Boeing 737 aircraft on short-haul routes. MAS recorded a net loss of RM2.52 billion in 2011, which was the largest in its company history, due to rising fuel costs and mismanagement. A major restructuring saw the appointment of a new CEO, Ahmad Jauhari Yahya, in September 2011. One of the first initiatives to stop the losses was a rationalisation of the network. The company suspended services to Surabaya, Karachi, Dubai, Dammam and Johannesburg. In February 2013, MAS reported a net profit of RM51.4mil for the fourth quarter. The airline's improved financial performance last year was mainly attributable to its route rationalisation programme, which saw an overall 8% reduction in ASK. This was matched by a marginal 1% reduction in revenue to RM13.76bil in 2012 and seat factor holding at 74.5%. The reduced ASK also helped MAS register a corresponding 14% decrease in expenditure. The airline struggled to cut costs in order to compete with a wave of new, low-cost carriers in the region. The airline lost RM443.4 million (US$137.4 million) in the first quarter of 2014. The second quarter—the first in the aftermath of Flight 370's disappearance - saw a loss of RM307.04 million (US$97.6 million), which represented a 75% increase over losses from the second-quarter of 2013. As a result, MAS has not made a profit since 2010. In the previous three years, the airline had booked losses of: RM1.17 billion (US$356 million) in 2013, RM433 million in 2012, and RM2.5 billion in 2011. Industry analysts expect MAS to lose further market share and face a challenging environment to stand out from competitors while addressing their financial plight. The company's stock, down as much as 20% following the disappearance of Flight 370, had fallen 80% over the previous five years, which contrasts with a rise in the Malaysian stock market of about 80% over the same period. A month after the disappearance, CEO Ahmad Jauhari Yahya acknowledged that ticket sales had declined but did not provide details. This maybe partially resulted from the suspension of the airline's advertisement campaigns following the disappearance. In China, where the majority of Flight 370 victims were from, bookings on Malaysia Airlines were down 60% in March. He said he was not sure when the airline could start repairing its image, but that the airline was adequately insured to cover the financial loss stemming from the incident. In August, the airline warned of poor second-half earnings, citing a 33% decline in average weekly bookings following the loss of Flight 17. Media reported that some flights were largely empty and that the airline had slashed prices well below competitors on several key routes. Even before the crash of Flight 17, many analysts and the media suggested that Malaysia Airlines would need to rebrand and repair its image and/or require government assistance to return to profitability. On 8 August, trading in the company's stock was temporarily suspended when Khazanah Nasional—the majority shareholder (69.37%) and a Malaysian state-run investment arm—requested that MAS' Board of Directors undertake a selective capital reduction exercise (e.g. buyback or cancel stock of other shareholders); Khazanah announced it will spend 1.38 billion ringgit (US$431 million; 27 sen per share) to compensate minority shareholders (a 12.5% premium of 7 August closing price). At the time, Khazanah Nasional did not announce much about its plans for the airline except that the airline had "substantial funding requirements" and that a "comprehensive review and restructuring" was needed. In May 2015, it was announced that the airline will be transferred to a newly founded "Malaysia Airlines Berhad" (MAB) by 1 September 2015, with rebranding of the airline also commencing that day. The new company will see a heavily reduced workforce and adjusted route network with focus on Asia according to its newly appointed CEO, Christoph Mueller. He also announced that Malaysia Airlines put some of its Airbus A380s up for sale. Four months later, MAB announced that they will add four new Airbus A350-900 aircraft to their fleet by the end of 2017 till the middle of 2018. The aircraft will be leased from Air Lease Corporation. The airline also expects to add two more A350-900s as well as two Airbus A330-900neo aircraft in the upcoming future. MAB then announced that it is set to undergo a brand overhaul involving a new name, logo and livery for its aircraft, with the changes to be unveiled on a date unknown. In April 2016, CEO Christoph Mueller resigned from his post after less than a year of leading the carrier's reorganising efforts, citing changing personal circumstances. Mueller initially planned to continue to serve as CEO until September 2016 and stay on the airline's board as a non-executive director to oversee the transition to a new CEO. It was subsequently announced that Peter Bellew has taken over Mueller as the new chief with effect from 1 July 2016, effectively cutting Mueller's tenure by a further two months. In April 2017, Malaysia Airlines announced that the airline's entire fleet will be tracked with the satellite flight tracking system. In October 2017, an unexpected announcement was made that Malaysia Airlines CEO Peter Bellew will return to Ryanair as Chief Operations Officer to help fix pilot problems. Bellew worked as flight operations director at Ryanair until 2014. Bellew's decision to leave Malaysia Airlines comes just over a year after former chief executive Christoph Mueller left the airline citing personal circumstances a year after being hired on a three-year mission to revive the state-controlled firm. Malaysia Airlines has its headquarters and registered office on the first floor of Administration Building, South Support Zone at Kuala Lumpur International Airport (KLIA), Sepang, in the Klang Valley region. The move was completed in December 2015. Previously the airline headquarters were on the third floor of the MAS Administrative Complex at Subang Airport, in Subang. Prior to the construction of the Kuala Lumpur MAS headquarters, the airline rented space in the UMBC headquarters. The airline had a permanent corporate headquarters in the Bangunan MAS, a 34 story building it owned along Jalan Sultan Ismail, in the Golden Triangle. The airline occupied 20 stories in the building. The building was built for RM88mil. In 2005 The Star said that the building was "reported to be worth between RM300mil and RM350mil". At one time before 2005 the airline chairperson, Raja Tun Mohar, made an oral promise to Tun Abdul Razak of the Government of Malaysia that the airline would not sell its headquarters. The airline had 600 employees in the building. In 2006, the airline moved its head office from the Kuala Lumpur building to the former headquarters in Subang, to reduce inefficiencies and generate cash. Channel News Asia stated that the airline had been "forced" to sell the former headquarters. Idris Jala, the managing director, said that the sale could net RM3bil. In the event it did not, the airline would try to rent out the floors it occupied. The first phase was scheduled to occur from January to March of that year, with the chairperson, executive director, managing director, company secretary, corporate communication officer, and finance communication officer moving to the Subang facility. In June 2006, Phase II was planned as a move for the distribution, marketing, and sales divisions of the company, to Administration Block Three. Around 2007 Permodalan Nasional Berhad purchased Bangunan MAS from the airline. The new owners planned to remodel the building, by installing a five star hotel apartment block and upgrade the offices to Grade A++. The airline planned to relocate its headquarters from Sultan Abdul Aziz Shah Airport to KLIA in February 2012. The airline has diversified into related industries and sectors, including aircraft ground handling, aircraft leasing, aviation engineering, air catering, and tour operator operations. It has also restructured itself by spinning-off operational units as fully owned subsidiaries to maintain its core business as a passenger airline. In 2013, Malaysia Airlines has 28 subsidiaries, with 25 of them fully owned by Malaysia Airlines. Malaysia Airlines experienced a RM1.25 billion loss in 2005. In 2006, the Business Turnaround Plan was introduced to revive the airline. At the end of the airline's turnaround program, in financial year 2007, Malaysia Airlines gained RM851 million net profit: a swing of RM987 million compared to RM134 million in losses in 2006, marking the national carrier's highest-ever profit in its 60-year history. The achievement was recognised as the world's best airline-turnaround story in 2007, with Malaysia Airlines being awarded the Phoenix award by Penton Media's Air Transport World. From the late 1990s up to 2007, Malaysia Airlines used the Going Beyond Expectations slogan to brand itself internationally. With the rollout of the Business Transformation Plan in 2008, its CEO rejected the idea of using MH's network or certain other features as its new branding strategy. Instead, the new branding strategy slogan is More than just an airline code. MH is Malaysian Hospitality, to emphasise the hospitality of its cabin crew instead of the airline's network and cabin classes. Since 2013, the airline has been using the slogan Journeys are made by people you travel with. However, with the onset of Flight 370 and Flight 17, the airline has used a number of slogans including "#keepflying" and "#flyinghigh". The hashtag "#bettertomorrow" was used after the renationalisation plan was announced, and the slogan "#todayishere" when the airline was nationalised in September 2015. It is expected that a new slogan will be launched when the airline rebrands itself. Malaysia Airlines introduced the Sarong Kebaya design on 1 March 1986 for female flight attendants. It was designed by the School of Fashion at Mara Institute of Technology (Malay: Institut Teknologi Mara) and later known as Mara University of Technology (Malay: Universiti Teknologi Mara). The batik material depicts the "kelarai" motif, which is a bamboo weave pattern. It appears in the background in subdued hues of the basic uniform colour. Superimposed on the "kelarai" motif is a mixture of Malaysian flora, such as the cempaka, jasmine and the leaves of the hibiscus. The geometric Sarawakian motif is used for the lapels of the baju, edges of sleeves and the "sarong". In January 1993, the colours of the batik were enhanced to complement the colour of the new uniform. The male flight attendants wear grey colour jackets. The history of the airline started in 1937, when Malayan Airways Limited was registered as a company. Flying operations started in 1947, with the aircraft bearing the symbol of a winged tiger. A new logo was introduced with the formation of Malaysia-Singapore Airlines in 1966, featuring the initials of the airline's name, MSA. In 1971, MSA split into two airlines, each with its own policies and objectives, leading to the birth of Malaysia's flag carrier, Malaysian Airline System (MAS). The name was chosen because, in abbreviated form, MAS (as in EMAS) in Malay means gold, to symbolise quality service. A corporate logo based on the wau bulan (moon kite) was eventually adopted in the following years. A new corporate logo designed by Dato' Johan Ariff of Johan Design Associates was introduced on 15 October 1987, retaining the essence of the moon kite, now with a sheared swept-back look painted in red (top) and blue (bottom). Along with the new corporate logo, a new type style - MALAYSIA, was created. It is italicised to slant parallel with the logo to accentuate speed as well as direction. Within this corporate typestyle, the letters M, A and S bear red clippings to denote the initials of the statutory name of the airline, Malaysian Airline System (MAS). They were added after the original design was rejected by former Prime Minister Mahathir Mohamad. The introduction of blue to the original red logo has national significance. The red and blue divides equally in the middle to denote equilibrium. Beginning 2010, all of Malaysia Airlines' new Airbus A330 and Boeing 737 aircraft sport the new standard airline livery featuring two strips of red and blue emerging from the bottom of the fuselage. The wau bulan on the tail was also refreshed. Although still featuring a sheared swept-back look with its colours in red and blue, its tails have been extended to appear twinned. Moreover, the airline's name on the fuselage is presented in full unlike before and it is entirely blue. In 2012, the corporate logo of red and blue wau bulan was refreshed. The new wau bulan faces from left to right, as it did in the original 1971 logo, and its tails have been extended. Initially, the airline settled for an all blue wau bulan but it has since reverted it to its red and blue form. The wordmark has also been modernised with a new typeface and the word "airlines" is now presented in lowercase. That same year, the airline also unveiled a new and exclusive livery for its Airbus A380 fleet to highlight the flagship carrier of the airline. It features an all-blue wau bulan on the tail and strip of blue ribbon on the fuselage and engines, the airline's name is entirely in blue as well. In August 2011, Malaysia Airlines agreed to collaborate with AirAsia through a share swap. The share swap between Malaysia Airlines' major shareholder and that of AirAsia was later undone in May 2012 due to resistance from certain quarters of its staff. On 1 February 2013, Malaysia Airlines became a member of the Oneworld alliance, thus adding 16 new destinations into the alliance's map. Malaysia Airlines would now be able to fly its passengers to over 842 destinations across 156 countries. Before the introduction of the Business Turnaround Plan in 2006, Malaysia Airlines operated 118 domestic routes within Malaysia and 114 international routes across six continents. Under the Business Turnaround Plan, numerous routes were axed and frequencies reduced. Among these routes are Manchester, Vienna, Fukuoka, Chengdu, Nagoya, Xi'an, Cairo, Kolkata, Ahmedabad and Zürich. Malaysia Airlines became the first airline in Southeast Asia to fly to South Africa, following the demise of apartheid, and was the only airline in Southeast Asia that served South America via South Africa until 2012. Prior the MH17 and MH370's crashes, it had further suspended services to Cape Town, Rome, Dammam, Karachi, Surabaya, Johannesburg and Los Angeles. After the removal of the destinations such as Istanbul, Male, Amsterdam, Paris, Brisbane (resumed June 2018), Frankfurt, Kunming, Krabi and Kochi (resumed March 2019), London is the only one left for the European destination, particularly with the strong presence of Airbus A380 and the Heathrow Terminal 4. As of March 2017, Malaysia Airlines flies to 57 destinations across Southeast Asia, North and South Asia, the Middle East, Australia and Europe. Its primary hub is Kuala Lumpur International Airport. It has a particularly strong presence in the Southeast Asia region, which, together with its subsidiaries MASWings and Firefly, connects Kuala Lumpur to the most destinations in Borneo. Apart from that, the airline has a key role in the Kangaroo Route, on which the airline provides onward connecting flights from main European gateways to major Australian and New Zealand gateways via Kuala Lumpur, within 5 hours. Malaysia Airlines also owns its own charter flight division. Malaysia Airlines' charter flights have flown to destinations around the world, such as Guilin, which was previously one of Malaysia Airlines' scheduled destinations, and Christmas Island. Malaysia Airlines has also been the official airline for the Manchester United Asian Tour It also has a substantial Hajj operation. As of April 2019, Malaysia Airlines has 84 active aircraft in its fleet. Of these 84 aircraft, 48 are from Boeing and 36 from Airbus. The Golden Lounge is the airport lounge for Malaysia Airlines Business Suite Class, Business Class passengers and Enrich Platinum and Enrich Gold, eligible oneworld and code-share partner members. The Golden Lounges have open bars and food catering. There are Golden Lounges throughout the world, and qualified passengers have reciprocal privileges at lounges operated by selected partners. The lounge offers services such as business centres, food catering, slumber rooms and child-care centres. In April 2008, the airline launched its new Regional Golden Lounge at Kuala Lumpur International Airport for regional-bound front-end passengers. 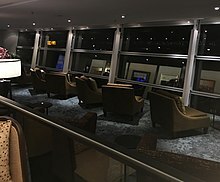 With this new lounge, Malaysia Airlines at Kuala Lumpur International Airport now has three lounges: the Satellite International Terminal Lounge, Domestic Lounge and Regional Lounge. Between May 2017 and February 2018, Malaysia Airlines conducted an extensive renovation that saw all three lounges at Kuala Lumpur International Airport progressively refurnished and remodelled. The renovation saw completion with the re-opening of the Satellite International Lounge in March 2018.
Business Suite Class (previously known as First Class) is offered only on the Airbus A350 and the Airbus A380. Malaysia Airlines offers the widest fully flat Business Suite class seats in the world on its A380 aircraft. The A380s feature eight semi-enclosed suites with a 23-inch flat-screen television. On the Airbus A350, the airline offers four fully enclosed suites with doors, and storage cabinets along the sides of the seats. Business Class (previously known as Golden Club Class) is available on all of Malaysia Airlines' fleet. In 2011, Malaysia Airlines introduced the new Business Class seats on their brand new Airbus A330-300. Newer regional business class seats were also introduced on the Boeing 737-800 to be used on short-medium haul routes such as Kota Kinabalu, Taipei and Manila. Seats made by Recaro within the business class cabin of new Airbus A380-800 are configured in pairs (2-2-2) layout, fitted with in-seat power and USB port, as well as new Select 3000i on a 15.4 inches touch screen panel, while the Boeing 737-800 are fitted in pairs (2-2) inclusive of the new Select 3000i and have recline ability. In April 2016, Malaysia Airlines introduced a new Business Class seat provided by Thompson Aero Seating equipped with fully lie-flat seats with configured in (1-2-1/1-2-2), for their A330-300. The same seat is subsequently used on the Airbus A350 fleet. In March 2018, following the delivery of the Airbus A330-200 fleet, Malaysia Airlines introduced another Business Class seat configuration retained from the previous operator of the aircraft, Air Berlin. Business Class are configured in a 1-2-1 lay-out with seats from manufacturer, Stelia. These planes are usually flown to high demand regional destinations and Auckland. Economy Class is available on all of Malaysia Airlines' fleet. Most of the fleet, including the Airbus A380, Airbus A350-900, Airbus A330-300 and Boeing 737-800 features a seat pitch of 30-32 inches and width of 17-18 inches. Some of the Boeing 737-800, of which are leased, have no personal TV but overhead TV's located in the aisles of the plane and feature a seat pitch of 29-30 inches. All A380s, A350-900s, A330-300s and newer Boeing 737-800 have the Select 3000i personal in-flight entertainment systems. In 2010, the Malaysia Airlines' Economy Class was awarded the "World's Best Economy Class" award by Skytrax. Malaysia Airlines has attracted both criticism and praise for its controversial decision to prohibit children from travelling in certain classes or cabins of its aircraft. Infants are not permitted in First Class on Malaysia Airlines' Airbus A380s due to the non-availability of baby bassinets in the cabin. Then-CEO Tengku Azmil Zahruddin explained the policy, saying the airline received complaints from First Class passengers that they "spend money on first class and can't sleep due to crying infants". 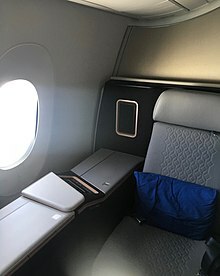 Malaysia Airlines subsequently claimed that an upgrade of the First Class cabin to fit new seats and an ottoman (which doubles as a visitor seat) meant "there was no facility for positioning bassinets in the First Class of the 747s". Malaysia Airlines has also stated that children under the age of 12 may not travel in the 70-seat upper deck economy section of the A380. "The economy seats on upper level will be allocated for business travellers. Passengers accompanying children under 12 years old age will be excluded from booking these seats." Malaysia Airlines says the decision "is to showcase the Economy Class zone in the main deck, enhanced and designated as a family and children friendly inflight zone. From the perspective of customers travelling with their families, the economy class family-friendly convenience would be a warm welcome. The main deck has more facilities such as toilets (8 for economy configuration of 350 seats) and the dual aerobridge airport facility supporting this deck will also mean a speedier/faster embarkation and disembarkation for this group of passengers." Select is the in-flight entertainment system of Malaysia Airlines. There are three types of Select: Select 3000i, Select 3000i Portable Media Player, and Select Mainscreen. All Malaysia Airlines Airbus A380, Airbus A350-900, Airbus A330-300 and newer Boeing 737-800 aircraft are equipped with an Inflight entertainment system, Select 3000i, with audio and video available in 14 languages. A touch-screen personal TV is available on board these aircraft. New deliveries of the Boeing 737-800 (9M-MX* and -MS*) aircraft would carry touch-screen based Select 3000i. 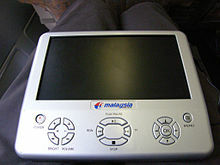 The Select 3000i Portable Media Player is provided to Malaysia Airlines' Business Class passengers on selected regional and medium-haul routes when operated by Boeing 737-800 (ML*) aircraft. It allows passengers a choice of movies, TV shows, sports and video games. Used in Economy Class on Boeing 737-800 (9M-ML*) regional and medium-haul aircraft, which features 15-inch drop-down retractable LCD screens are installed at every fourth seat row. Malaysia Airlines signed a 3-year sponsorship deal with Premier League club Liverpool FC in October 2016, which gives them the right to be its Official Global Airline Partner. In addition, a six-minute advertisement video of Malaysia Airlines will be broadcast during home games at Anfield until the 2018-2019 season. Malaysia Airlines' frequent flyer program is called Enrich by Malaysia Airlines. Enrich comprises airlines, banks, credit-card issuers, hotels and retailers around the world. On 30 September 1987, the airline introduced the Esteemed Traveller frequent-flyer program. In the early 1990s, Malaysia Airlines, Cathay Pacific, Thai Airways International and Singapore Airlines launched their joint Asian frequent-flyer program: Passages. The joint program was officially dissolved in 1999, and the Enrich frequent-flyer program made its debut after the split from Passages. On 12 July 2006, Malaysia Airlines introduced its enhanced frequent-flyer program. The program is now known as Enrich by Malaysia Airlines (Enrich). 4 December 1977 – Malaysian Airline System Flight 653, a Boeing 737-200 – registered 9M-MBD – was hijacked and crashed in Tanjung Kupang, Johor, killing all 100 people on board. 18 December 1983 – Malaysian Airline System Flight 684, an Airbus A300B2 – registered OY-KAA – crashed 2 km short of the runway at Subang Airport, with no fatalities among the 247 passengers and crew. 15 September 1995 – Malaysia Airlines Flight 2133, a Fokker 50 – registered 9M-MGH – touched down too far along the runway at Tawau Airport, Sabah and crashed in a shantytown during the subsequent go-around. Of the 49 passengers and 4 crew on board, 32 passengers and 2 crew were killed. The probable cause was poor handling of the aircraft by the pilot. 8 March 2014 – Malaysia Airlines Flight 370, a Boeing 777-200ER – registered 9M-MRO – carrying 227 passengers and 12 crew, went missing on a flight from Kuala Lumpur International Airport to Beijing Capital International Airport. Although the whereabouts of the plane remain unknown, satellite data indicates that the plane was lost in the Southern Indian Ocean and all 239 people on board perished. On 5 August 2015 the Malaysian government confirmed a flaperon from a 777 found washed up on Réunion Island belonged to Flight 370. A piece of aircraft wreckage (an outboard flap) found on Pemba Island off the Tanzanian coast in June 2016 was also confirmed by the Malaysian Transport Ministry to belong to MH370. 17 July 2014 – Malaysia Airlines Flight 17, a Boeing 777-200ER – registered 9M-MRD – en route to Kuala Lumpur International Airport from Amsterdam Schiphol Airport was shot down over Ukraine by a Buk surface-to-air missile. All 283 passengers and 15 crew members aboard were killed. ^ "Malaysia Airlines to Join Oneworld in February". Malaysiandigest.com. 30 October 2012. Archived from the original on 2 November 2012. Retrieved 17 February 2013. ^ "Malaysia Airlines: State fund proposes takeover". BBC News. 8 August 2014. Retrieved 24 April 2015. ^ "Khazanah Nasional Berhad". Archived from the original on 28 April 2015. Retrieved 24 April 2015. ^ a b "Our Story". malaysiaairlines.com. Malaysian Airline System. Archived from the original on 17 July 2014. Retrieved 28 July 2014. ^ "Corporate Info". malaysiaairlines.com. Malaysian Airline System. Retrieved 18 March 2017. ^ Jansen, Bart (17 July 2014). "Hard for Malaysia Airlines to survive after two disasters". USA Today. Retrieved 28 July 2014. ^ a b Thomas, Geoffrey (9 December 2011). "Malaysia Airlines unveils plan to regain profitability". Archived from the original on 15 December 2012. Retrieved 28 July 2014. ^ "The Founders" (PDF). Wearnes (WBL Corporation). Archived from the original (PDF) on 18 July 2011. Retrieved 25 June 2009. ^ "Mail takes flight". SPM Singapore. Archived from the original on 7 July 2012. Retrieved 11 September 2011. ^ "Flight into fantasy". ALPAS Singapore. Archived from the original on 30 July 2012. Retrieved 4 May 2010. ^ "Malaysia Airlines — Our Story". Malaysia Airlines. Retrieved 11 February 2011. ^ "Straits Steamship Company". National Library Singapore. Archived from the original on 14 March 2009. Retrieved 25 June 2009. ^ "Telekom Malaysia and Malaysia Airlines Synergise Business Relationship". Telekom Malaysia Berhad. Archived from the original on 12 October 2007. Retrieved 3 September 2007. ^ "Flight Into Fantasy". Airline Pilots Association Singapore. Archived from the original on 30 July 2012. Retrieved 25 June 2009. ^ "The Creation of Singapore Airlines". Singapore Airlines. Retrieved 1 July 2007. ^ "Notice to All Debators". New Straits Times. 22 September 1972. Retrieved 30 August 2014. ^ a b c d "Malaysia Airlines Business Turnaround Plan" (PDF). Malaysia Airlines. Archived from the original (PDF) on 14 July 2011. Retrieved 11 February 2011. ^ Alex Dichter; Fredrik Lind & Seelan Singham (November 2008). "Turning around a struggling airline: An interview with the CEO of Malaysia Airlines". McKinsey & Company. ^ "Malaysian Airline returns to profit in 2007, exceeds financial targets". Forbes. 25 February 2008. Archived from the original on 29 September 2008. Retrieved 23 March 2008. ^ "Tengku Datuk Azmil Zahruddin made MAS MD/CEO". The Star. 28 August 2009. Retrieved 18 March 2017. ^ "MAS orders 15 A330s". Flightglobal.com. 22 December 2009. Retrieved 20 July 2014. ^ "Malaysia Airlines shares dip on 2011 loss". BBC. 1 March 2011. Retrieved 7 August 2014. ^ Zaheer, Farhan (11 January 2012). "Pack up: Malaysia Airlines calls it quits in Pakistan". The Express Tribune. Retrieved 7 August 2014. ^ Kok, Cecilia (1 March 2013). "MAS swings back to black, reports net profit of RM51.4mil for Q4". The Star (Malaysia). Retrieved 4 March 2013. ^ a b "Malaysia Airlines Records RM443 million Loss for Q1 2014". Malaysia Airlines. 15 May 2014. Retrieved 3 July 2014. Much of the costs associated by MH370 will be covered by insurance. ^ a b c "Malaysia Airlines Financial Losses Grow". New York Times. Reuters. 29 August 2014. Retrieved 30 August 2014. ^ a b c Raghuvanshi, Gaurav; Ng, Jason (6 April 2014). "Malaysia Airlines Says Priority Is Families of the Missing, Though Ticket Sales Fall". Wall Street Journal. Retrieved 3 July 2014. ^ a b c "Flight's Disappearance Knocks Malaysia Airlines". New York Times. 15 May 2014. Retrieved 3 July 2014. ^ Neuman, Scott (29 August 2014). "Malaysia Airlines Cuts A Third Of Its Workforce After Steep Losses". npr.org. National Public Radio. Retrieved 30 August 2014. ^ Kitching, Chris (28 August 2014). "Struggling Malaysia Airlines slashes prices on long-haul routes from London and gives away free flights as customers and crew desert it following twin disasters". Dailymail. Retrieved 30 August 2014. ^ Venkat, P.R. ; Raghuvanshi, Gaurav (2 July 2014). "Malaysia Airlines Could Go Private". Wall Street Journal. Retrieved 9 August 2014. ^ Patterson, Thom (18 July 2014). "Malaysia Air faces new, serious threat as company". CNN. Retrieved 9 August 2014. Analysts said it may take a government rescue to save the company from financial disaster. ^ "Malaysia Airlines considers tie-up with Etihad Airways as restructuring process slowly begins". centreforaviation.com. Centre for Aviation. 17 June 2014. Retrieved 9 August 2014. ^ Ngui, Yantoultra (2 July 2014). "Exclusive: State fund plans to take Malaysia Airlines private for restructuring: sources". Reuters. Retrieved 9 August 2014. ^ Zhang, Benjamin. "How Malaysia Airlines Can Be Saved From Financial And Reputational Ruin". Business Insider. Retrieved 23 July 2014. ^ Hamzah, Al-Zaquan Amer; Leong, Trinna; Ngui, Yantoultra (8 August 2014). "Malaysia Airlines To Go Private With A $435 Million Government Investment". Business Insider. Retrieved 9 August 2014. ^ "MAS: No disruption to current service". New Straits Times. 29 August 2014. Retrieved 30 August 2014. ^ a b c MOUAWAD, JAD (8 August 2014). "Malaysia Steps In to Save Its Reeling National Airline". New York Times. Retrieved 9 August 2014. ^ Creedy, Steve (9 August 2014). "Malaysia Airlines in $460m bid to clear air". The Australian. Retrieved 9 August 2014. ^ Hamzah, Al-Zaquan Amer; Ngui, Yantoultra (8 August 2014). "State fund to take over Malaysia Airlines, plans 'complete overhaul'". Reuters.com. Reuters. Retrieved 9 August 2014. ^ a b MacLeod, Calum (29 August 2014). "Malaysia Airlines slashes jobs, routes in overhaul". Retrieved 30 August 2014. ^ "Troubled Malaysia Airlines to be completely revamped - new CEO". RTE. 25 May 2015. Retrieved 18 March 2017. ^ "Malaysia Airlines signs lease agreement with Air Lease Corp for four Airbus planes". Reuters. 10 September 2015. Retrieved 18 March 2017. ^ "Malaysia Airlines inks A350, A330neo lease deal with AL". ch-aviation. 11 September 2015. Retrieved 18 March 2017. ^ "Malaysia Airlines prepares for rebranding, CEO Christoph Mueller says". stuff. 2 October 2015. Retrieved 18 March 2017. ^ "Peter Bellew named CEO of Malaysia Airlines". Channel NewsAsia. 7 July 2016. Retrieved 18 March 2017. ^ "Malaysia Airlines to track planes with satellites". BBC News. 19 April 2017. Retrieved 19 April 2017. ^ "Malaysia Airlines to track planes with satellites to track its fleet from space". MicNode News. 19 April 2017. Archived from the original on 20 April 2017. Retrieved 19 April 2017. ^ Steinbuch, Yaron (19 April 2017). "Malaysia Airlines becomes first to track planes with satellites". New York Post. Retrieved 19 April 2017. ^ "Malaysia Airlines Recovery Plan Quarterly Update (1 Sept-30 Nov 15)." Malaysia Airlines. Retrieved on 5 May 2016. ^ "World Airline Directory." Flight International. 30 March 1985. p. 94. "3rd Floor, Administrative Building, MAS Complex, Subang International Airport, Subang, Selangor, Malaysia. MA 37614." ^ "World Airline Directory." Flight International. 29 March 1986. p. 100. "3rd Floor, Administrative Building, MAS Complex, Subang International Airport, Subang, Selangor, Malaysia"
^ a b c d e f g h Krishnamoorthy, M. "MAS-sive move." The Star. Saturday 7 January 2006. Retrieved on 31 October 2012. ^ a b c d e "MAS promised not to sell headquarters." The Star. Sunday 25 December 2005. ^ "Directory: World airlines." Flight Global. 30 March-5 April 2004. 30 March-5 April 2004. p. 37. "33rd Floor, Bangunan MAS, Jalan Sultan Islmail, Kuala Lumpur, Federal Territory, 50250, Malaysia"
^ "Malaysia Airlines boosted after sweeping reforms." Channel News Asia. 7 March 2010. Retrieved on 31 October 2012. ^ "Bangunan MAS to be upgraded." The Star. Thursday 21 October 2010. Retrieved on 31 October 2012. ^ Sidhu, B.K. "MAS to axe unprofitable routes." The Star. Thursday 10 November 2011. Retrieved on 31 October 2012. ^ "Malaysia Airlines Subsidiaries". Malaysia Airlines. Archived from the original on 22 February 2008. Retrieved 23 March 2008. ^ "Malaysia Airlines Gets ATW's Phoenix Award". Bernama Malaysia. Archived from the original on 10 February 2009. Retrieved 29 January 2008. ^ "2013 Malaysia Airlines Annual Report" (PDF). Malaysia Airlines. Archived from the original (PDF) on 24 July 2014. Retrieved 13 September 2014. ^ "Welcome 'home' - to an aeroplane". The Star. 24 February 2008. Archived from the original on 30 April 2008. ^ "Golden assets". The Star. 18 December 2007. Archived from the original on 5 January 2009. ^ "Airline makes better use of its MH code". The Star. 1 February 2008. ^ "Johan Design Associates - Industrial & Structural Design". Johan Design Associates. Retrieved 20 July 2014. ^ "Malaysia Airlines considers a new name, brand and livery". World Airline News. 28 July 2014. Retrieved 19 March 2017. ^ "Malaysia Airlines quietly launches new logo". Campaign Asia. 16 April 2012. Retrieved 19 March 2017. ^ "First MAS A380 revealed in special livery". Air Transport World. 9 March 2012. Retrieved 18 March 2017. ^ "AirAsia and Malaysian Airlines agree a share swap deal". BBC. 10 August 2011. Retrieved 15 August 2014. ^ "MAS joins oneworld alliance". The Star. 2 February 2013. Retrieved 18 March 2017. ^ Sidhu, B.K. " "Archived copy". Archived from the original on 20 March 2017. Retrieved 19 March 2017. CS1 maint: Archived copy as title (link)." Yahoo! Singapore. Thursday 10 November 2011. Retrieved on 31 October 2012. ^ "Manchester United to raise money for UNICEF during the 2005 Asia Tour". Unicef. 2005. ^ "Profile on Malaysia Airlines". CAPA. Centre for Aviation. Archived from the original on 29 October 2016. Retrieved 29 October 2016. ^ "China Airlines / Malaysia Airlines proposes codeshare service from Nov 2016". ^ Liu, Jim (3 April 2018). "Uzbekistan Airways / Malaysia Airlines expands codeshare routes from April 2018". Routesonline. Retrieved 3 April 2018. ^ "Malaysia Airlines Golden Lounge". Malaysia Airlines. Archived from the original on 22 September 2007. Retrieved 29 March 2008. ^ "Airline Lounges At Melbourne Airport". Retrieved 24 April 2015. ^ "Malaysia Airlines' Satellite Golden Lounge reopens – Business Traveller". Business Traveller. Retrieved 24 November 2018. ^ "Malaysia Airlines wins the World's Best Airline Cabin Staff award for 2012". Archived from the original on 25 December 2012. Retrieved 24 April 2015. ^ Fickling, David (25 May 2012). "Malaysian Airline Fits A380s With Widest Seats in the Sky". Bloomberg. Retrieved 25 August 2014. ^ "Flight review: Malaysia Airlines A350 business class – Business Traveller". Business Traveller. Retrieved 24 November 2018. ^ "Malaysia Airlines unveils new A330-300". Business Traveller.com. 15 April 2011. ^ "The best seats in Malaysia Airlines' new A330 business class". Australian Business Traveller. 4 April 2016. Retrieved 18 March 2017. ^ "Malaysia Airlines will fly ex-Airberlin A330s to Auckland". Australian Business Traveller. Retrieved 24 November 2018. ^ "Malaysia Airlines Planes, Fleet and Seat Maps". www.seatguru.com. Retrieved 24 November 2018. ^ "Malaysia Airlines wins award for the World's Best Economy Class at the 2010 World Airline Awards". Skytrax. Archived from the original on 2 December 2010. Retrieved 20 October 2010. ^ "Malaysia Airlines defends controversial 'baby ban' in First Class — Flights | hotels | frequent flyer | business class — Australian Business Traveller". Ausbt.com.au. 7 July 2011. Retrieved 17 February 2013. ^ Flynn, David (7 July 2011). "Malaysia Airlines defends controversial 'baby ban' in First Class". Australian Business Traveller. Retrieved 7 August 2014. ^ "Malaysia Airlines Defends Controversial Ban on Babies in First Class". Christianpost.com. 29 June 2011. Retrieved 17 February 2013. ^ "Malaysia Airlines declares kid-free zone on new MAS Airbus A380 - Flights | hotels | frequent flyer | business class — Australian Business Traveller". Ausbt.com.au. 13 April 2012. Retrieved 17 February 2013. ^ "Enhanced Family and Children-Friendly Inflight Zone on Our New A380 Economy Main Cabin". Facebook. Retrieved 17 February 2013. ^ "Malaysia Airlines Successfully Launches e.Digital's Portable 8" eVUTM IFE System and Services". Marketwire.com. 17 September 2007. Retrieved 20 July 2014. ^ "Liverpool sign lucrative three-year deal with Malaysia Airlines". Mail Online. Retrieved 14 June 2017. ^ "Malaysia Airlines teams up with Liverpool FC - Business News | The Star Online". www.thestar.com.my. Retrieved 14 June 2017. ^ "Malaysia Airlines announces enhanced Enrich program". China Post. 31 August 2006. Retrieved 21 August 2014. ^ "Enrich - Earn Enrich Miles - Partner Airlines". Malaysia Airlines. 21 October 2013. Retrieved 20 July 2014. ^ Jon Livesey (17 July 2014). "Curse of Malaysia Airlines? 5 tragic moments in airline's history before MH17 and MH370". Daily Mirror. ^ "Accidents and incidents of Malaysia Airlines". China Daily. 8 March 2014. ^ "Accident description". Aviation Safety Network. Retrieved 10 March 2011. ^ "Airliner with 239 on board missing over Asia". Malaysia Sun. Archived from the original on 9 March 2014. Retrieved 8 March 2014. ^ "MH370 Flight Incident" (Press release). Malaysia Airlines. Archived from the original on 17 May 2014. ^ https://www.bbc.com/news/world-asia-26716572 "Families told missing plane lost". BBC News. 24 March 2014. Retrieved 24 March 2014. ^ "Authorities confirm debris found in Tanzania is from MH370". 15 September 2016. ^ "Physics Buzz: How Inmarsat Hacked Their Data to Find Flight MH370". Retrieved 24 April 2015. ^ Jethro Mullen and Pamela Boykoff, CNN (26 June 2014). "Australia: MH370 probably on autopilot as it flew south - CNN.com". CNN. Retrieved 24 April 2015. ^ Patterson, Thom (17 July 2014). "A second lost Boeing 777 for Malaysia Airlines". CNN. Retrieved 18 July 2014.